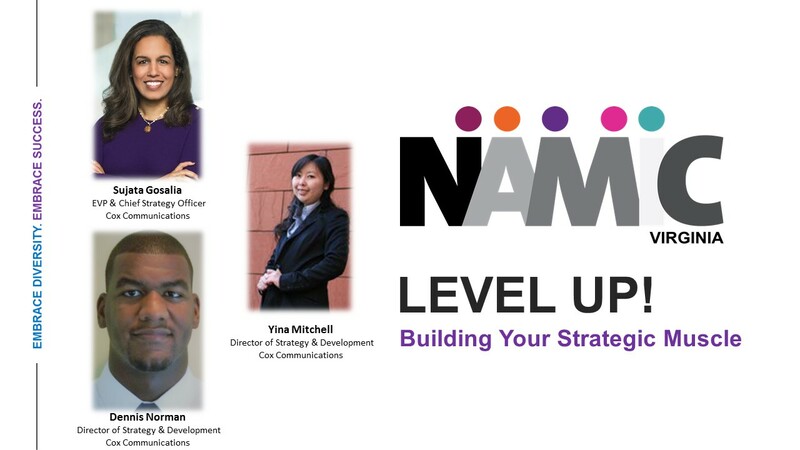 On March 20th, workshop attendees took their career to the next level by joining us at NAMIC Virginia’s signature event LEVEL UP! At this full day interactive workshop, attendees learned to structure their approach to strategic challenges by learning how to think, plan and act strategically from an expert panel of career strategist from our Premier Partner, Cox Communications!! 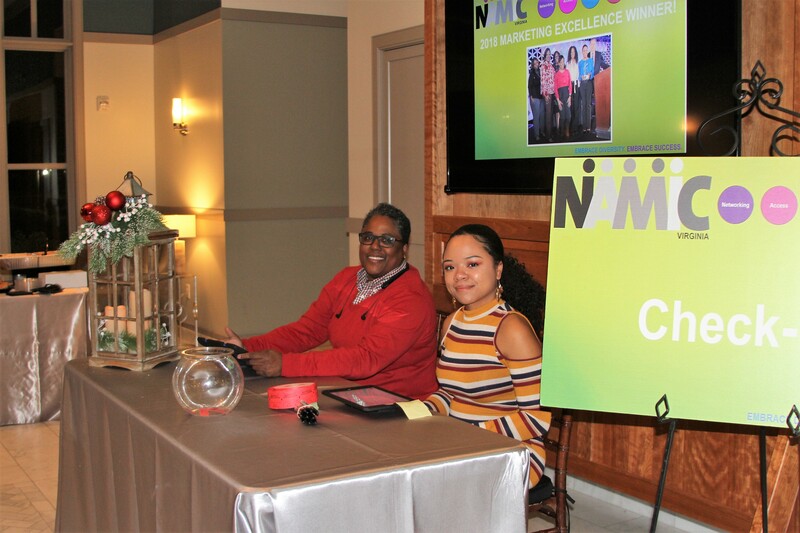 The NAMIC Virginia Chapter embraces diversity and success by sharing real world topics to broaden our perspectives in the communications industry. A successful strategy requires Diverse Perspectives!! Feel free to review our slideshow of images from the event below!! 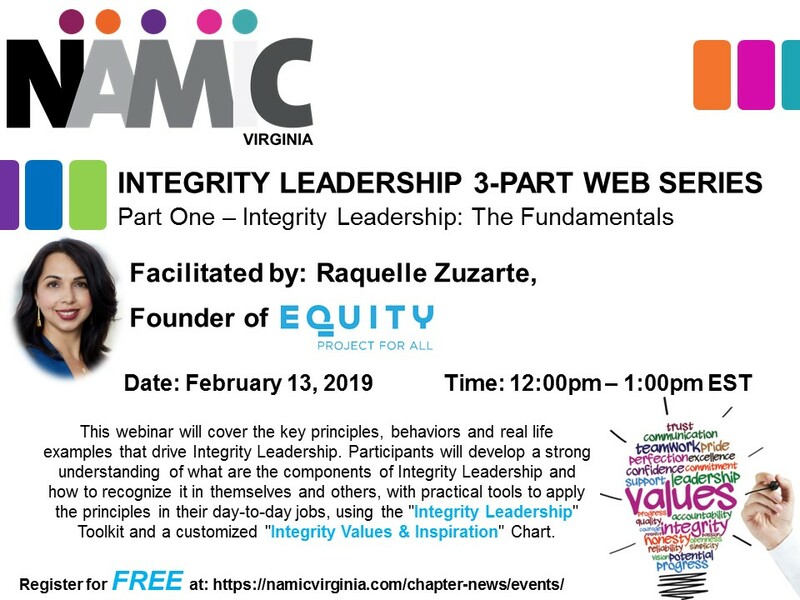 In Part One of our 3-Part Series around Leadership Integrity Raquelle Zuzarte, Founder of EQUITY: Project for All, illustrated key principles, behaviors, and real life examples that drive Integrity Leadership. She provided practical tools to apply these Integrity Leadership principles to every day life on the job and in our personal lives. Stay Tuned for the remaining session coming in June and September! The 32nd Annual NAMIC Conference was an amazing experience for the NAMIC Virginia Team! It’s been a long journey from our May 2017 incorporation but the results are more than worth it! NAMIC VA – Chapter of the Year has a very nice ring to it! Our committees and their leaders are the foundation to everything we do! In addition to the Chapter of the Year honor we are pleased to congratulate our Marketing Chair, Ashley Veal, our Programming Logistics Chair, Jessica Jones and their teams for their time and effort in 2017! The hard work of these amazing teams are the reason @namic_va took home the Marketing Excellence and Event Management Awards for our 2017 performance! To see more picture from the event, click HERE. Learn while you lunch!! 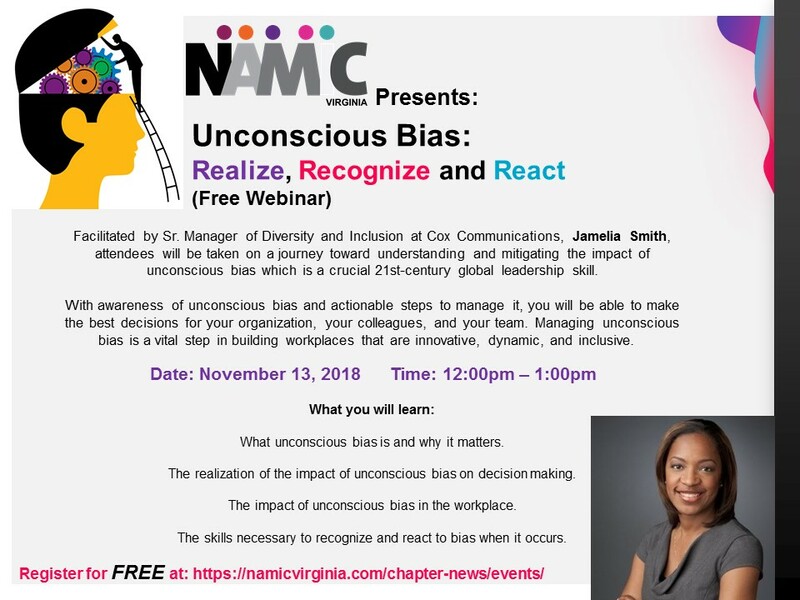 Unconscious bias can be more prevalent than we realize and it can also be more difficult to free workplaces of. If left unchecked, unconscious bias can thrive in hiring, promotions, and in feedback. Learn more about this very intriguing and timely topic at our upcoming webinar on November 13th!! One Year and Counting with NAMIC VA! 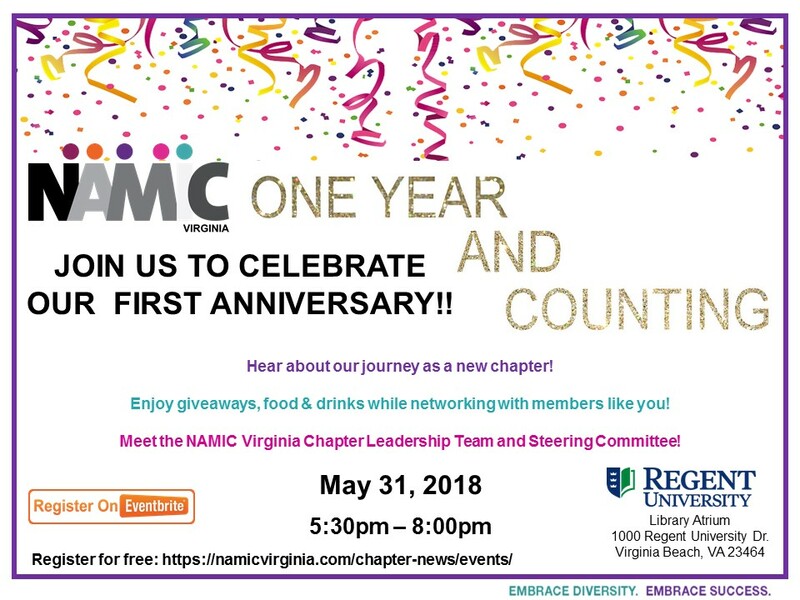 On May 31st, NAMIC Virginia members and their colleagues recounted the chapter’s journey to incorporation and action packed first year while enjoying giveaways from our sponsors, refreshments and great networking! The chapter also had the pleasure of hearing from special guest, James C. Jones, Senior Vice President of Education and Diversity Solutions with NAMIC National and Joiava Philpott, NAMIC National Board member and Vice President of Regulatory Affairs with Cox Communications. NAMIC Virginia has had an amazing first year and the celebration of our one year anniversary was just as amazing! Thank you to Regent University for providing a wonderful space for this milestone event! Sponsored by: Cox Communications, HBO, Showtime and Regent University! 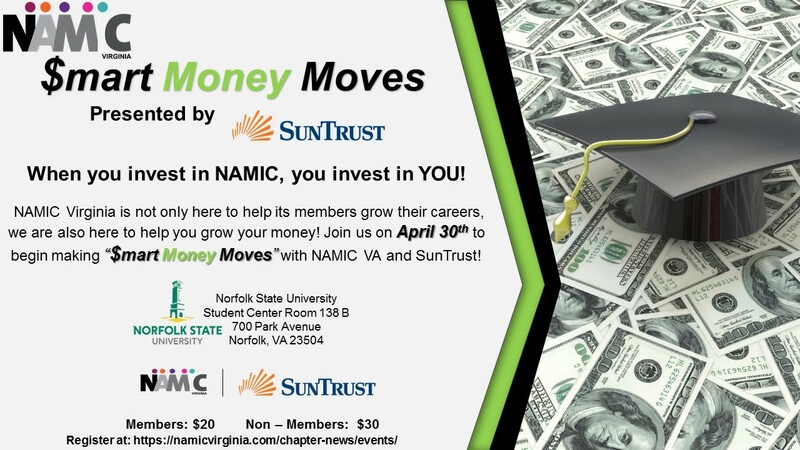 Make Smart Money Moves with NAMIC VA! 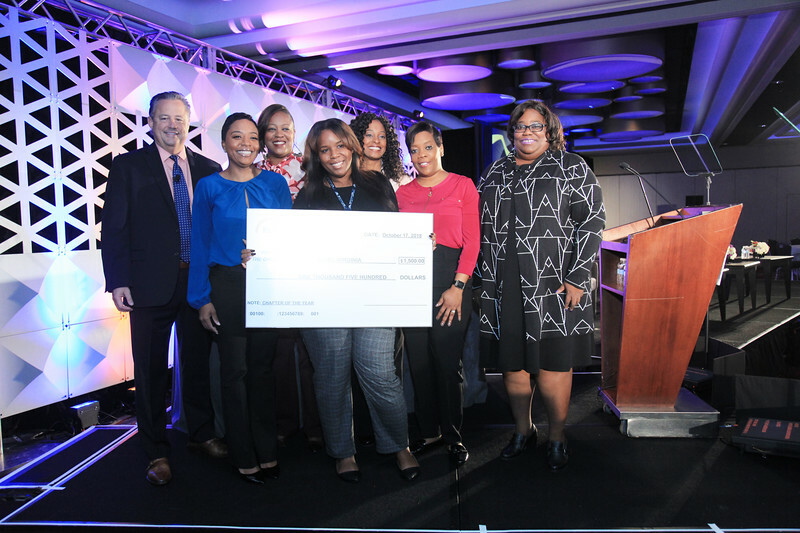 On April 30th, our partners at SunTrust Bank helped members invest in your financial future! During the “Retirement – Planning for a Life Well Spent” presentation participants were able to assess whether they are on track to reach your savings goals, begin planning for retirement, and learn about he challenges retirees face when they aren’t prepared. Help us raise money with Yankee Candle Fundraisers! Sign back into the portal to send family and friends the link to our shopping page via email or social media. You can also make an individual purchase using the Group Number 999979883.